On arrival meet and assist at the airport and transfer to prebooked hotel for overnight stay. Delhi : India's capital & a major gateway to the country, contemporary Delhi is a bustling metropolis which successfully combines in its fold the ancient & the modern. Its strategic location was one of the prime reasons why qutab minarsuccessive dynasties chose it as their seat of power. New Delhi also reflects the legacy the British left behind . The division between New & Old Delhi is the distinction between the capitals of the British & the Moghuls respectively. So, wherever the visitor goes, he will invariably confront the citys’ past. After breakfast, full day city tour of old & modern capital of India. Visit Jama Masjid, the largest mosque in India. Built by Shah Jahan, the construction was started in 1844 and was not completed until 1658 ; Red Fort, which was also built by Shah Jehan. This massive fort was built from 1638 to 1648 ; Chandni Chowk and Rajghat - the cremation site of Mahatma Gandhi. Witness the India Gate, the Presidents House & the Parliament. Visit Humayun's Tomb : built in mid 16th century this is an early example of Mughal architecture; Qutab Minar. 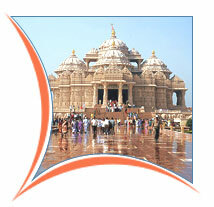 The tour ends with a visit to Laxmi Narayan Temple (Birla Mandir). After breakfast, transfer to Jaipur. Upon arrival, check in at prebooked Hotel. Jaipur : The capital city of the state of Rajasthan also know as “Pink City” owes its name, its foundation and planning to the great warrior astronomer Maharaja Jai Singh II. The city of Jaipur has broad avenues. The city sits on a dry lak e bed in a wild and somewhat arid landscape, surrounded by barren hills surmounted by fortresses and crenellated walls. Afternoon, city tour of Jaipur. After breakfast, excursion to Amber Fort enroute witness the façade of Hawa Mahal or the Palace of Winds which was built in 1799. Amber Fort - The ancient capital of the state until 1727 when Jai Singh decided to move from his hillside fortress at Amber to new site on the plains. 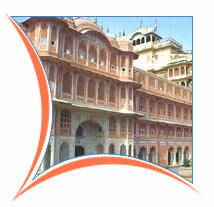 The construction of this fort began in 1592 by Raja Man Singh, the Rajput commander of Akbar’s army. The fort is a superb example of Rajput architecture, stunningly situated on a hillside and overlooking a lake which reflects its terraces and ramparts. 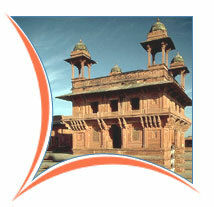 Visit the Jagmandir or the hall of victory glittering with mirrors, Jai Mahal & temple of Kali. Ascend on elephant back, the hill, on which the fort is situated. After breakfast, city tour of Agra. Visit Red fort, which was built by Emperor Akbar in 1565, and additions were made up until the time of his grandson, Shah Jahan. It contains the hall of public and private audiences amongst many other beautiful structures; Itmad-ud-daulah, which was constructed by Nur Jahan between 1622 and 1628 and is very similar to the tomb she constructed for her husband, Jehangir, near Lahore in Pakistan; the highlight of the day - The Taj Mahal, which was constructed by Shah Jahan in memory of his wife Mumtaz Mahal. Construction of the Taj began in 1631 and was not completed until 1653. After breakfast, leave for Delhi enroute visit Sikandra - Mughal Emperor Akbar's Mausoleum. Arrive Delhi and checkin at prebooked hotel. Rest of the day at leisure. Free for individual activities.